Tuesday and Thursday 11:00 am–8:00 pm, Wednesday and Friday to Sunday 11:00 am–5:00 pm. Monday closed. 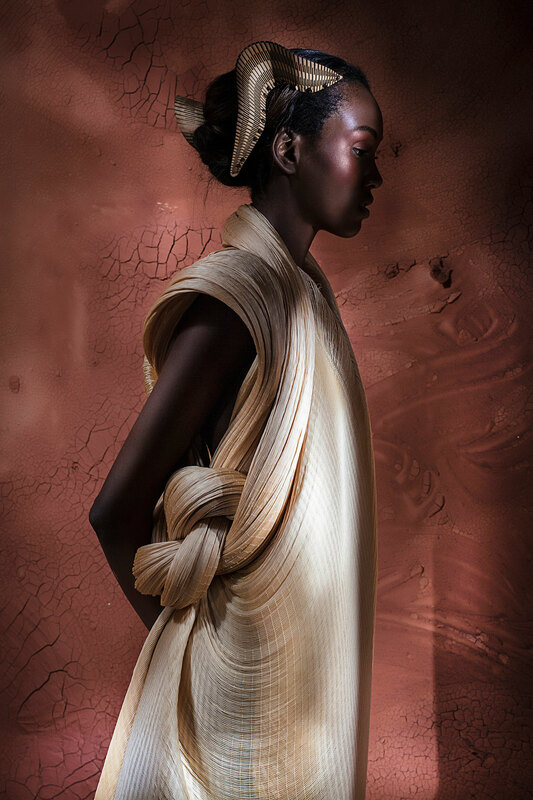 Utopian Bodies: Fashion Looks Forward is the amazing new exhibition being held at Liljevalchs Konsthall in Stockholm, Sweden. 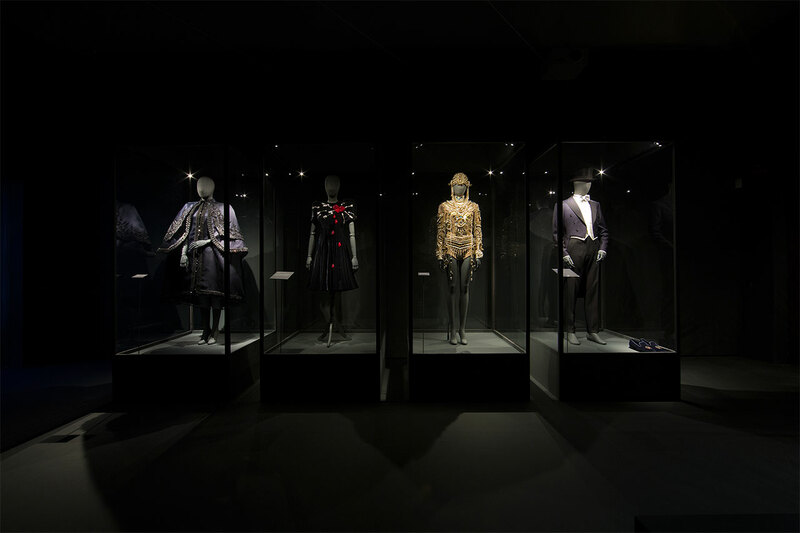 By focusing on the positive aspects of fashion and how it relates to the human form, this exhibition aims to inspire visitors of all ages to search for their perfect vision through observation and participation, all the while shining light on our future and the impact fashion has on it. 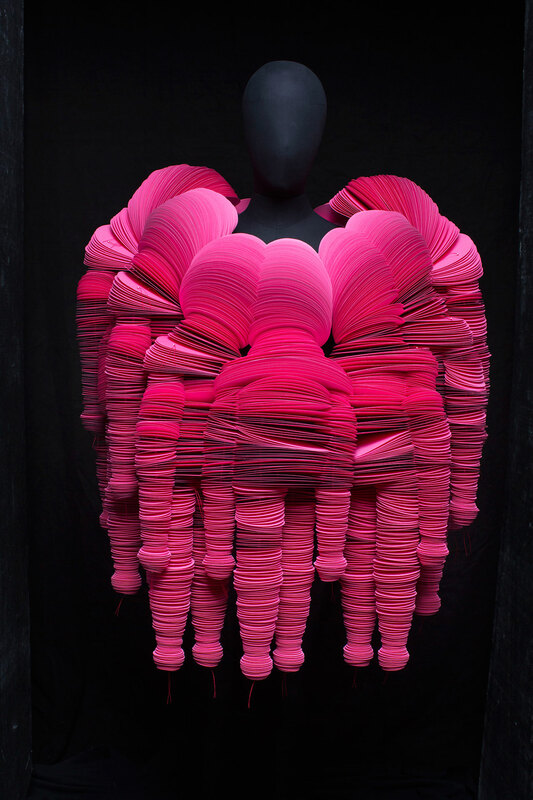 H&M "Love" dress, in the exhibition gallery of the same name. Photo by Mattias Lindbäck. The over 200 objects, images and videos being showcased at the exhibition are ingeniously arranged along no less than eleven galleries, inspired by ideas and themes that are of pressing urgency and importance today: Sustainability, Change, Technology, Craft & Form, Craft & Colour, Resistance & Society, Resistance & Beauty, Solidarity, Memory, Gender Identity and Love. 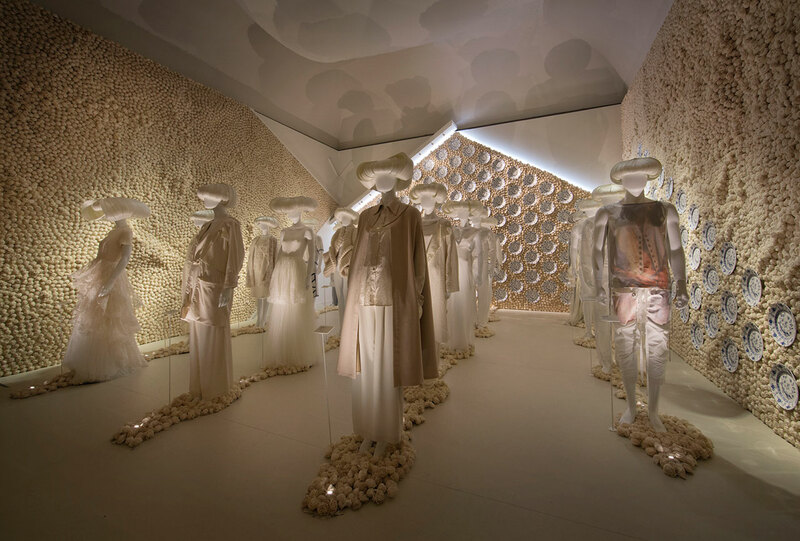 Each of the eleven galleries explores the connection between these ideas and the concept of Utopia by highlighting the marriage between technology and creativity, featuring garments and installations that demonstrate advanced design, inventive craftsmanship and forward thinking. 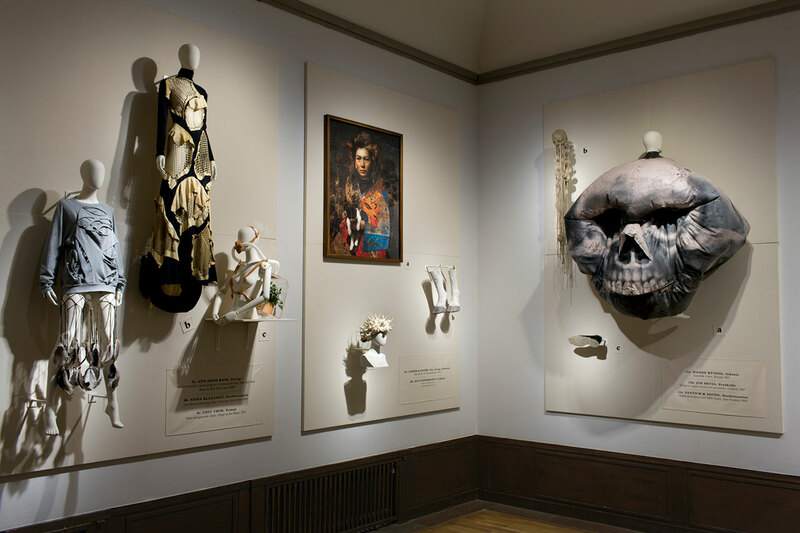 Utopian Bodies, installation shot. 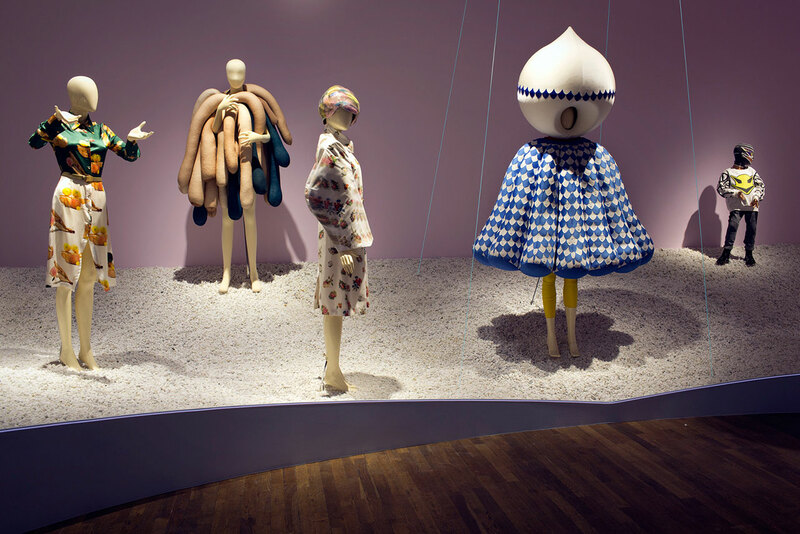 Viktor & Rolf "Hana Bedtime Story" (Courtesy of Museum Boijmans Van Beuningen Rotterdam on loan from Han Nefkens Fashion on the Edge), flanked by designs by Sonia Rykiel and Charles Le Mindu. Photo by Mattias Lindbäck. 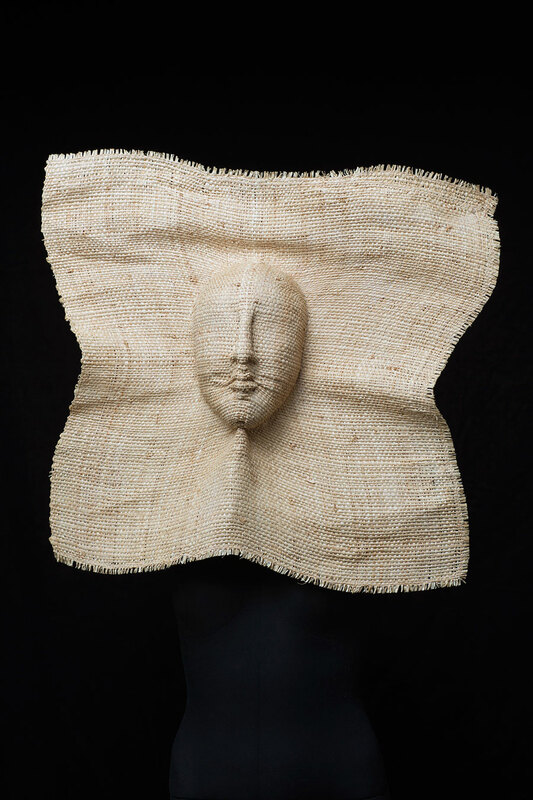 Charlie Le Mindu, headpiece "Kiss me", SS 2011. Photo by Vernie Yeung. 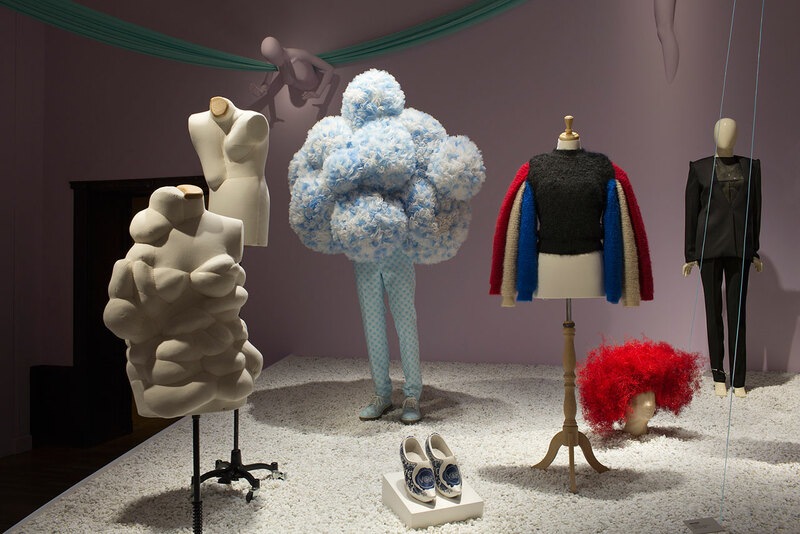 The exhibition, which runs until February 7, 2016, is a multidimensional visual feast, presenting iconic items from the international scene and from private collections, such as a floral Dior couture ensemble (SS 2013); Hussein Chalayan’s pioneering table skirt (Afterwards 2000); Issey Miyake’s zero-waste King & Queen installation (SS 1999) and Stephen Jones Millinery’s dreamlike hats. 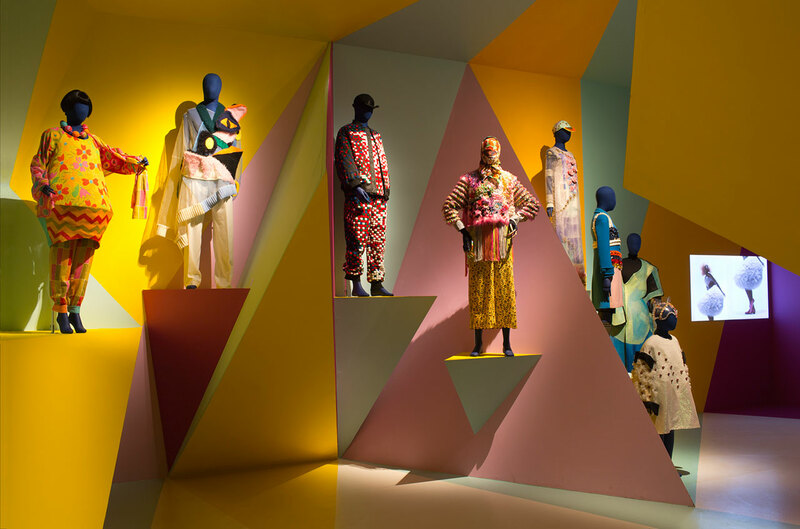 Films directed by Geoffrey Lillemon, Nick Knight and Lucy McRae are screened throughout giving visitors an opportunity to view an array of objects by many international designers, such as Gucci, Acne Studios and Comme des Garcons for H&M. 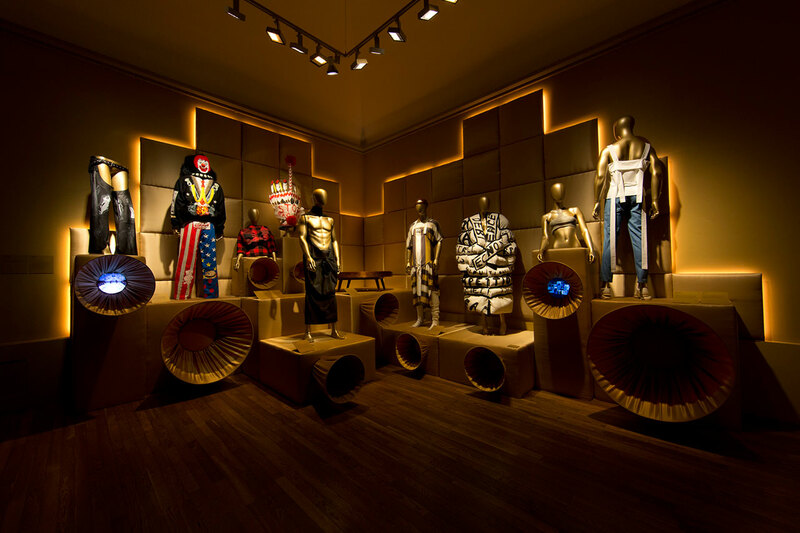 The new international avant-garde generation is also represented by designers such as Ryohei Kawanishi, Anrealage and Vogue Fashion Fund nominees Gypsy Sport and Chromat, amongst others; in addition, 16 Swedish designers have been specially commissioned to create unique garments for the exhibition. Utopian Bodies, installation shot of Technology gallery. Photo by Mattias Lindbäck. Utopian Bodies also showcases the latest in wearable technology, while addressing the question of how fashion is dealing with the global climate crisis through innovative exhibitors such as Smart Textiles who created the first completely recyclable cotton fabric, Qmilks, who make clothes out of biologically degradable milk fibres, and Ying Gao who creates garments that interact with the onlookers’ voice or gaze. With that said, traditional craftsmanship is also embraced, with exhibits by Swedish court jewellers W.A. Bolin, Saville Row tailors Gieves & Hawkes and Parisian shoemakers Masaro; interviews with many of these brands are included in the dual language (Swedish and English) exhibition catalogue, amongst other texts by highly notable international writers, journalists, editors and professors. Utopian Bodies, installation shot of Craft & Colour installation. Photo by Mattias Lindbäck. 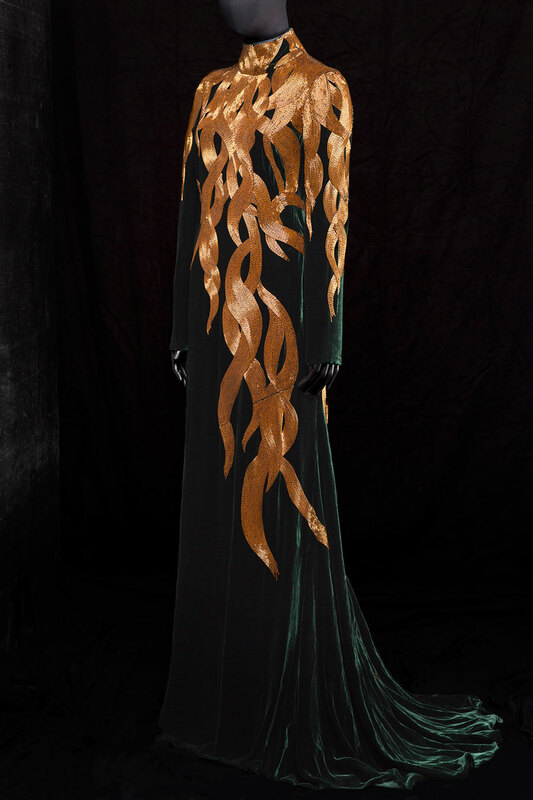 Alexander McQueen, Dress "In Memory of Elizabeth Howe, Salem, 1692" AW 2007. Courtesy of RKL Consulting. The Memory Room is a very novel section of the exhibition which highlights fashion’s “material memory,” that is, the personal relationship between a garment and its wearer where participants have been asked to provide a piece that tells a personal story; renowned contributors include Hamish Bowles, editor-at-large of Vogue, iconic model, Twiggy, and esteemed designer, Christian Lacroix. 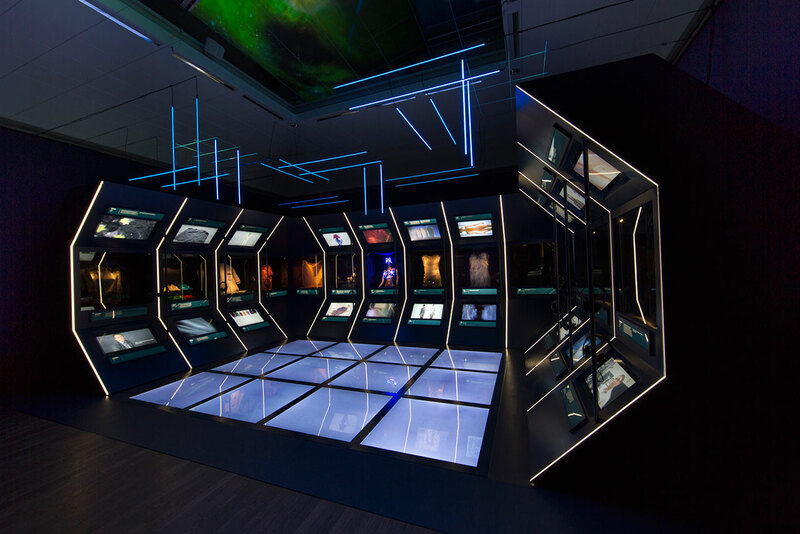 But since the future truly does belong to children, the entire exhibition extensively focuses on inspiring kids though fun interactive activities (such as a treasure hunt, and children’s art exhibit) and a specially illustrated catalogue written by a children’s author. Utopian Bodies, installation shot of Craft & Colour gallery. Photo by Mattias Lindbäck. Utopian Bodies, installation shot of Craft & Form gallery. Photo by Mattias Lindbäck. Utopian Bodies, installation shot of Resistance & Society gallery. Photo by Mattias Lindbäck. 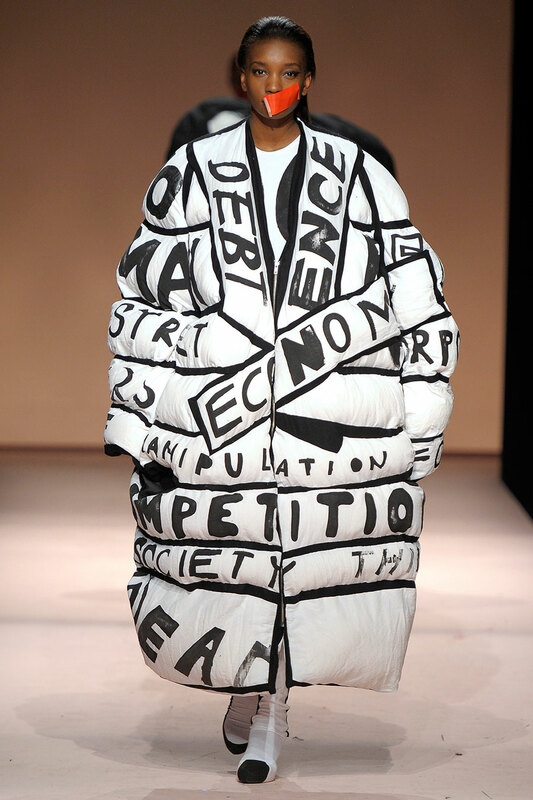 Marketa Martiskova, Ensemble "Protest" 2012. Photo by Etienne Tordoir. 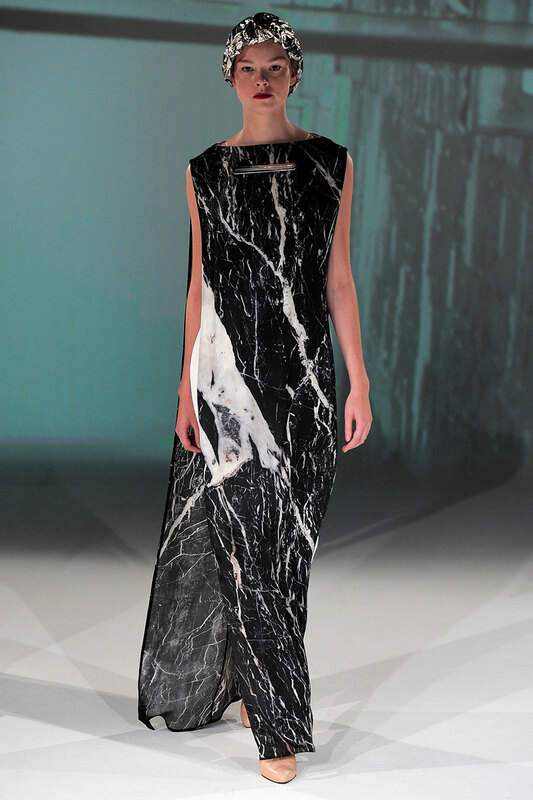 Hussein Chalayan, Ensemble SS 2013. Utopian Bodies, installation view of Change gallery. On the walls, designs by Ann-Sofie Back, Fiona Blakeman, Chiu Chih, Iris Schieferstein and Manon Kundig. Photo by Mattias Lindbäck. Anrealage, Ensemble WIDESHORTSLIMLONG, AW 2010. 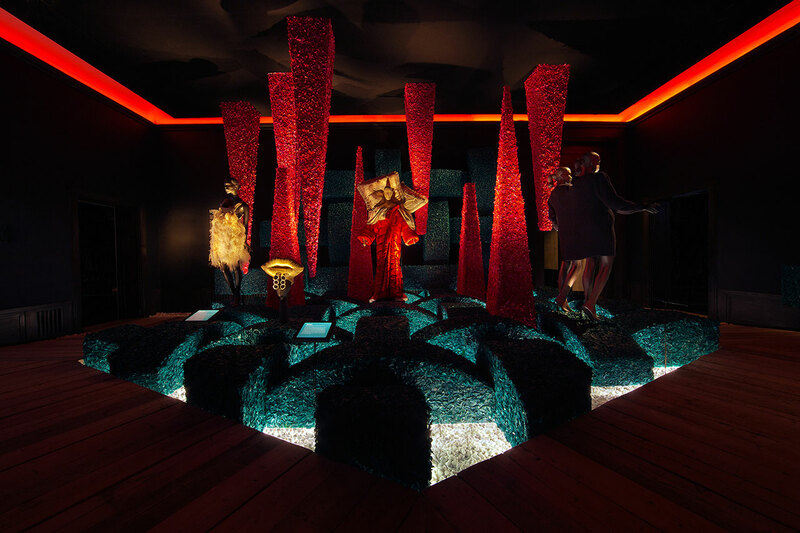 Utopian Bodies, installation view of Sustainability gallery, with dresses by Issey Miyake, Dai Fujiwara, H&M, Hussein Chalayan and Miguel Mesa Posada. Photo by Mattias Lindbäck. Utopian Bodies, installation shot of Resitance & Beauty gallery. Photo by Mattias Lindbäck. Utopian Bodies, installation view of Resistance & Beauty gallery. Photo by Mattias Lindbäck. 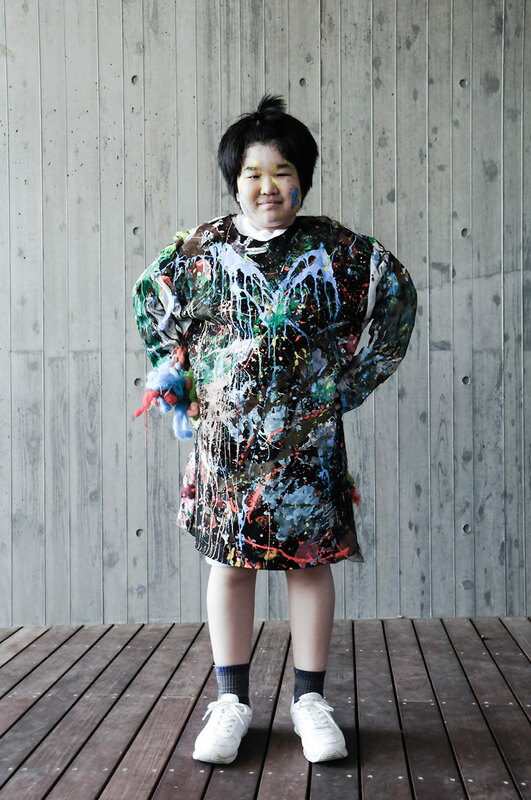 Ryohei Kawanishi, ensemble "Fairy Tales" 2012. Photo by Yuta Kawanishi. 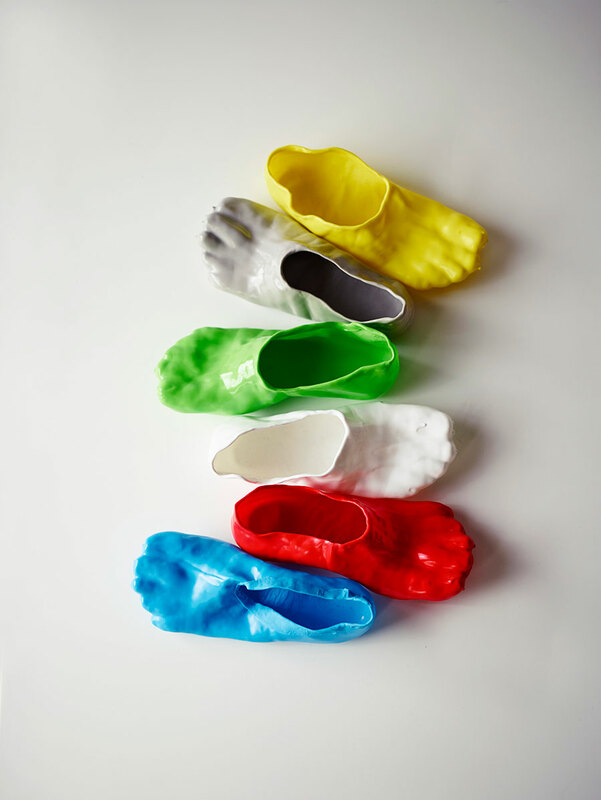 Satsuki Ohata, Fondue Slipper, 2014. 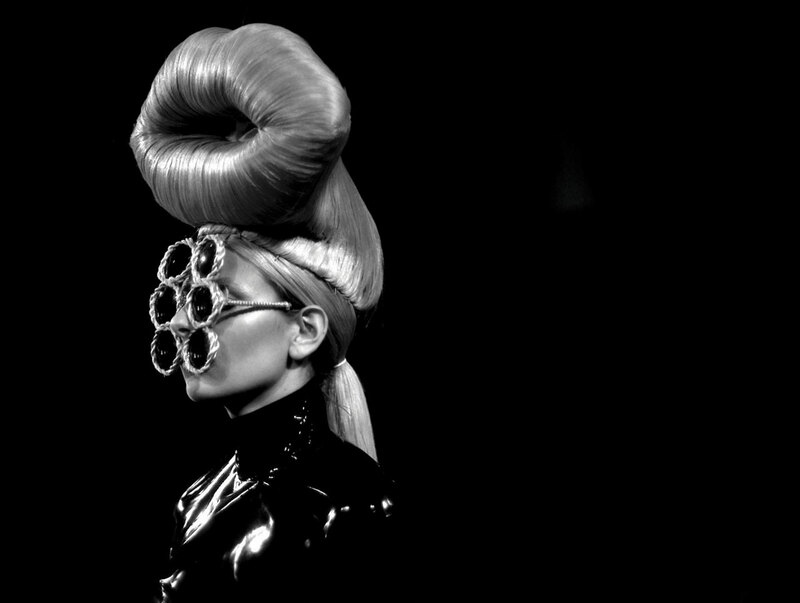 Walter Van Beirendonck, headpiece "Weird" AW 2005. 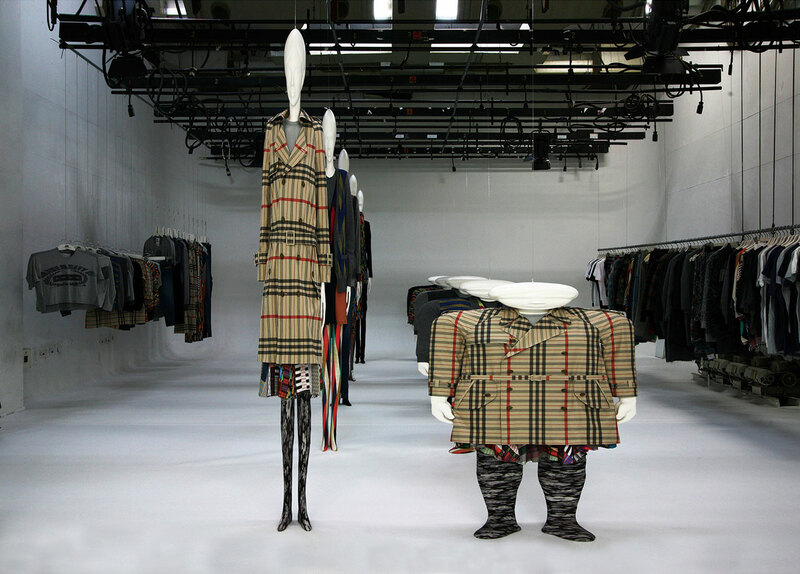 Courtesy of Fashion Museum Province of Antwerp. Photo by Roland Stoops. Bea Szenfeld, MINI MIKI 2015. Photo by Mattias Lindbäck. Anna–Sara Dåvik, Kikero 2015. Photo by Mattias Lindbäck. H&M, Beauty Beyond Debris 2015. Photo by Mattias Lindbäck. 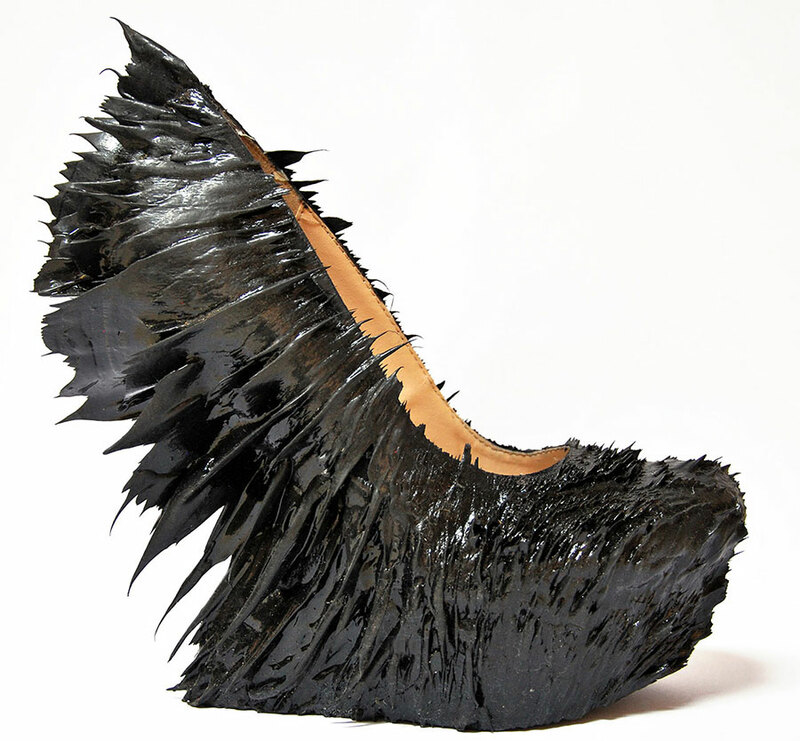 Jolan van der Wiel x Iris van Herpen, Magnetic shoe. Photo by Federico Da Fies. 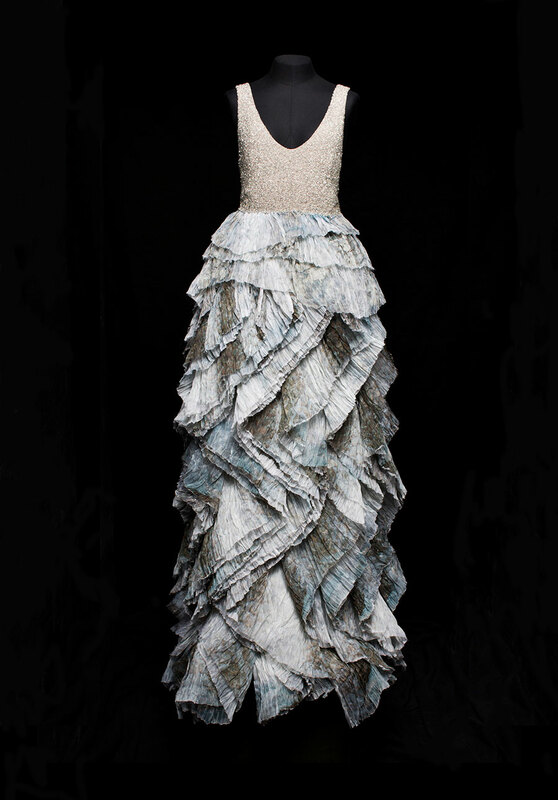 Miguel Mesa Posada, Dress "Altiplano" 2014. Photo by Estudio Silva / Moreno.